Being a former offensive lineman in high school and college, Andy Reid has always put an emphasis on building strong offensive and defensive lines. How do the lines look going into the 2008 season..
Trent Cole is coming off of his first Pro Bowl season and should continue to be a pass rushing force off of the edge. Juqua Parker provides decent quickness opposite Cole and should be pushed by Victor Abiamiri for playing time and the starting position. Chris Clemons will bring much needed speed to the group and can also be used as a linebacker if the Eagles go to a 3-4 scheme. As a DE or LB, Clemons will get after the quarterback. The starting tackles, Bunkley and Patterson, formed an effective tandem in 2007 and should continue to improve in 2008. Patterson was on the cusp of a Pro Bowl selection last year. Darren Howard and Trevor Laws should provide decent depth at the end and tackle positions. Offensive Line: In 2006 the line gave up 29 sacks. In 2007 the number ballooned to 49 sacks. Improvement is a must in 2008 as the Giants and Cowboys can and will bring the pressure. 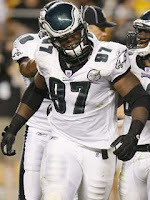 Center Jamaal Jackson needs more consistency from game to game. After beating out Hank Fraley in 2006 for the starting job, Jackson regressed in 2007. He has the size to be dominant. Shawn Andrews is the stud of the group. Trips to the Pro Bowl are becoming an annual thing. Andrews must avoid the injury bug in 2008. Tackles Tra Thomas and John Runyan are both getting up in years and entering the final years of their contracts. Getting one more effective year from each will be the key to McNabb remaining in one piece and keeping Winston Justice off of the field. Left Guard Todd Herremans continues to have the edge over Max Jean-Gilles for the starting nod. His natural position is out at tackle, so continued improvement in technique will be key to holding onto the starting position. Nick Cole, Gilles, and Justice appear to be the top back-ups going into training camp.